Welcome to the beginning of one of the great adventures of your life! The years to come will be exciting, unforgettable in the best possible way. It’s going to be great – great but not easy, not without its challenges. If it were easy, anybody could do it, and we wouldn’t have to spend the time to admit the very best students. 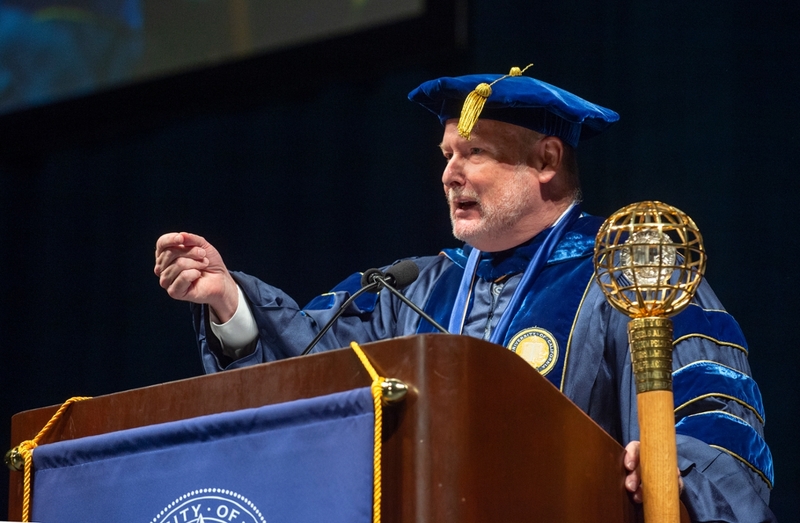 We will walk beside you in the years to come as you work toward your degree, and we will continue to be there for you after you have earned your degree, when at commencement – which will be here sooner than you think – you set off to make your mark upon the world. You have heard a lot about how you will be spending your time here in the years to come. You’ve learned about housing and dining and clubs and hiking trails and the ARC and Boba on Ring Road. But as you begin this adventure I want to remind you why you are really here. And the best way to do that is to remind you why this great university was created a little more than 50 years ago. It’s simple really: our mission is to serve the people by curating, creating, and transmitting knowledge. We curate, create, and transmit knowledge. That’s our job. Our purpose is to amass expertise so that we might understand important and complicated questions. In doing this we also act as a caretaker of inherited knowledge, allowing us all to compare the wisdom of those who came before us with our own views. As we engage in scholarly inquiry we also generate new knowledge – knowledge that solves problems, eradicates ignorance, identifies new challenges, improves our values, and hopefully, becomes a basis for social progress. And then we transmit what we have learned with young, talented academic achievers – with all of you – because through your accomplishments you have demonstrated that you have the talent and character to participate in this vitally important mission. You have shown that you are prepared to understand things even when understanding requires hard work and serious thought. This is why we built this extraordinary campus, with amazing labs, studios, libraries, clinics, and learning spaces. This is why we recruited a faculty made up of women and men who are the very best in the world in their disciplines. They are amazing. They will change your life for the better. And they can’t wait to share with you what they know. With their help, you will spend your time at UCI hearing, understanding, and assessing ideas – ideas about the nature of life, the meaning of novels, the lessons of history, the triumphs of cultural expression, the key to performance excellence, the definition of human liberty or social justice, the building blocks of matter... ideas about every topic that is deserving of the attention of curious, talented, and caring people. To be here is to share a love of ideas, of exchange, of discovery. I tell you this because the biggest regret I hear from college graduates is that they did not take full advantage of our broad and diverse world of ideas, and so I urge you, as you march toward your degrees, to also expand your curiosity and expose yourselves to fields or debates outside your current areas of interest. It will be a lost opportunity if you leave UCI with the same beliefs and interests you have right now. You are now members of a prestigious scholarly community that prides itself on its academic and research excellence. There are certain “rules of the road” for such communities. For example, we are open to new ideas. If a person of good faith believes we are mistaken about something and is willing to explain why we are wrong, we welcome the chance to improve our thinking. We evaluate each other, not on the basis of whether someone else agrees with us, but on their mastery of the required disciplinary knowledge, and on the quality of their arguments, evidence, or performances. We believe that the pursuit of knowledge requires independent-minded inquiry, evidence-based reasoning, logical argumentation, familiarity with relevant information, fair debate, and experimentation. We believe we will achieve a better understanding of matters if we are willing to engage competing perspectives, learn from those who hold different viewpoints, and reassess our views in light of new evidence and arguments. We expect our claims and conclusions to be evaluated by other experts, who are encouraged to find weaknesses in our arguments and conclusions. These are the norms and values that enable universities to achieve their distinctive mission in society. It’s why you take exams, and it’s why the work of our faculty is peer-reviewed by the most preeminent people in their fields. To be in this world is to have the quality of your ideas scrutinized and evaluated, relentlessly, so that when you leave your ideas and arguments are better. Consequently, over the next few years, some of your cherished views may be challenged. We will support you, but that support consists of empowering you to more effectively engage our world of ideas, not shielding you from ideas that make you uncomfortable or make you mad. This is why we cannot, and will not, censor or punish people merely because they express ideas we do not like. Even if you think the idea is disrespectful. Or hateful. Or dangerous. We will protect against harassment and incitement and true threats and other actions that are not protected under American law. But we will not treat the mere expression of an idea as something to be punished or censored. I want you to hear this from me now, because hardly a week goes by without this issue arising at some campus somewhere, and before it arises again at UCI I want you to know our position. We will not prevent someone from speaking on campus merely because of the views that will be expressed. We will also protect members of the campus community, and their invited guests and speakers, from efforts to silence them through disruptive activities – and if necessary we will sanction those who seek to violate the rights of others through disruptive activities. A condition of being part of our world of ideas is that you allow people who have different beliefs to speak or listen to people you disagree with. Then again, no one has a right to be free from criticism, and so we will always ensure that members of the campus community can peacefully protest or hold competing events when they disagree with the views that others are expressing. Also, while you (and others) have the right to invite people to campus who do not care about our scholarly values – individuals who are interested only in bringing the culture of internet trolling and doxing into our community – then please don’t be surprised if you are criticized. Just because you have a right to do something does not mean it is the right thing to do. We can only perform our distinctive mission if we create a climate of mutual respect and honest debate. I agree that you are free to try to undermine this culture, in the sense that I, as chancellor, have (and claim) no authority to censor or punish you because I think your program is an assault on our values. Still, it is a matter of great urgency for us to defend the values of a scholarly community. After all, physicists did not decide whether light was a wave, a particle, or something else, by trolling or shouting down their opponents. I hope you will encourage leaders who represent your views to do so in the spirit of our scholarly community. Let’s invite serious thinkers to campus, not clowns who care about nothing but their reputation as provocateurs. Let’s expect viewpoint diversity on important matters, and evaluate choices on invited guests, not on whether we agree with them, but on whether we consider them well-informed, thoughtful, and interesting. When serious thinkers come to campus let’s take advantage of all opportunities to pose hard questions, and then, let’s listen to answers and evaluate their quality. As we officially start this journey together let us commit to learning as much as we can from each other, and beyond that, let us commit to support each other as human beings engaged in a common enterprise to generate and transmit knowledge to humanity. In a world where too many people seek out that which divides us, let us remain united, and let us go that extra mile to deepen our understanding of each other, to build bridges, to talk rather than yell, to debate rather than fight, to love rather than hate, to protect rather than exploit. Let us model for the world how a diverse community can live and work together, even when we do not always agree. I end these remarks by invoking the official motto of the University of California. Pursue that which is illuminating. Shed light on fascinating and important questions. Be a vessel through which enlightenment eradicates the darkness – the darkness of ignorance, the darkness of intolerance. You are here to do great and important things. It’s time to get started.